Despite efforts being made, the European Public Prosecutor's Office (EPPO) might not be agreed by the end of the year, as are the expectations of the European Commission and the Council’s Presidency. Another deadline will be missed and the discussions surrounding the new European institution show the strength already gained by integration scepticism. The draft regulation for the formation of the EPPO was discussed for the first time in its entirety on October 14 by EU justice ministers. So far, the draft was being discussed in sections for small “victories” were easier to achieve. On October 14, for the first time, an approximate cost for the project was presented as well. 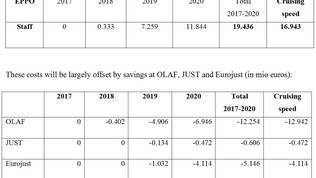 In previous discussions, ministers of several member states (mainly Scandinavian) asked that the European Commission to make an estimate of expenses and benefits. Commissioner for Justice Věra Jourová (Czech Republic, ALDE) presented the estimate with several caveats. It is based on the current text of the draft regulation, which provides for shared competence between the prosecution and member states, which means sharing the costs. Moreover, it was done without having full agreement on the EPPO’s competencies and without having come to an agreement whether it will deal with VAT fraud. The documents provides for, should an agreement for the formation of the EPPO is reached by the end of the year, that it should start working in full (with the so called cruising speed) in 2021. By then, expenses on it would have reached 26.7 million euro, which includes costs for personnel, buildings, operating expenses. 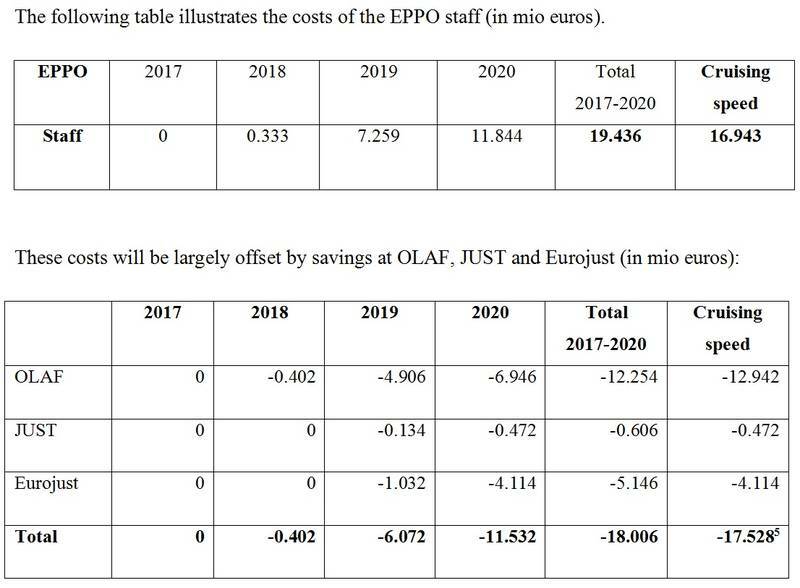 In the first year of work for the EPPO (the year 2019), the EC believes that expenses would be 11.9 million euro. The total benefit of the new semi-supranational institution are estimated at 204 million euro in 2019, which includes the investigation of common crime against the Union’s financial interests, as well as VAT fraud with a 2 million euro threshold (more details on this follow). 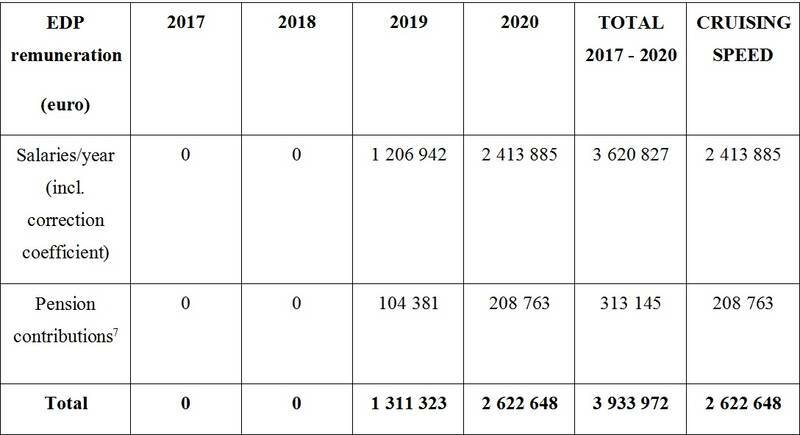 It is expected that benefits from the EPPO will reach over 3 billion euro in 2021. The expenses presented are just for the supranational dimension of the prosecution and will be covered by the European budget. Shared national competences and expenses on them will be covered by national budgets. Along those lines is the main conflict on whether the EPPO should investigate VAT fraud or not. 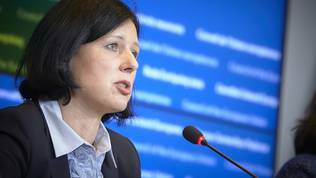 During the public part of the discussion of the full text of the draft Regulation, Commissioner Jourová once again expressed her concerns regarding the prosecution’s competences. “We have to make sure that the EPPO's competence is not only crystal clear but that it also remains meaningful. Unfortunately I don’t think this is the case with the current article 20/3B. This provision would lead to excluding a significant number of offences for which EPPO is established”, warned Mrs Jourová. The Netherlands continues to have reserves towards the draft Regulation and it still remains to be seen whether the Dutch parliament will agree that the country participates in the EPPO. Dutch Minister of Justice Ard van der Steur insisted that the EPPO plays a rather more of a supportive role to national authorities, than what is provided for in the current draft of the text. The minister also expressed his concerns by the intention to transferring money and personnel from Eurojust and OLAF to the prosecution. A concern expressed by many ministers. Van der Steur finds the EC’s estimate of expected benefits from having the EPPO too optimistic, especially regarding the results of fighting VAT fraud (if of course it is agreed that this would be included in its competences). Italian Justice Minister Andrea Orlando also expressed unhappiness by this next version of the text, but for the exact opposite reasons – the EPPO should have power over national authorities. He believes that it is only this way that the EPPO will be truly effective. Italy has insisted from day one on a strong and independent of member states EPPO, with very wide powers, including even fighting organised crime. An idea, which turned out to be completely impossible to implement at the current stage. German Minister of Justice Heiko Maas advocates for not going into new arguments, but accepting the draft in the shape it currently is in. “I think that over the years we have reached a large degree of agreement on the proposed regulation. Therefore I would like to state quite clearly that of course there are still things which we would have liked to be different, but on the basis of this current draft we'd like to withdraw all our reservations we've had so far because in the foreseeable future and if possible this year we would like us to conclude the work on the draft regulation”, were his words. He strongly warned that no articles, which have already been agreed on, should be reopened. Lithuania announced that it is ready to support major elements of the consolidated text. Luxembourg, too, stood behind Germany, having Minister Félix Braz add that the added value of the EPPO will make sense only if it had a true European dimension. The central body will have to make the main decisions on the cases and will have to exert control over investigations, performed by the delegated European prosecutors. The minister asked not to weaken the powers of the Permanent Chambers. “The EPPO has to be absolutely independent and we have to be extremely cautious here”, added Mr Braz. Cyprus also accepted positively the proposed compromising text, but kept its reserves on several points. Poland once again was very critical about the text and even stated that Warsaw might reject it. Polish concerns are that some of the Prosecution’s competences are too wide and lead to some very difficult procedures at the national and European level. Hungary also expressed reserves, although it did soften its positions from what they were. Until recently, its resistance stemmed from the fact that the regulation would force amendments to the Hungarian Constitution. The minister announced that they are already planned. Despite that, however, Budapest continues to disagree with the prosecution’s competences. He asked that national rules and procedures prevail. Strong support for the text and the quick wrap-up of work on this dossier came from Paris as well. France announced that it shares Germany’s concerns. “This is taking three years so far and successive presidencies have made contributions and now we have a consolidated text which responds to the major issues at stake for example balance, independence and seeking added value”, stated the French representative. Everything right now is coming down to fine tuning, he said and pleaded that everyone made some allowances. Belgium, too, agreed with the text. Bulgaria supported its colleagues from Germany, Luxembourg, Belgium, and France. Justice Minister Ekaterina Zaharieva repeated that Bulgaria prefers a strong, effective, and independent EPPO. She believes that the proposed texts, despite the compromises, still provide the necessary powers to the EPPO. 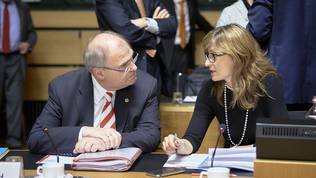 She repeated the words of the Luxembourg justice minister that the independence of the EPPO comes at a price. Estonian Justice Minister Urmas Reinsalu expressed disagreement with the EC’s assessment of costs and benefits. In his opinion, there is not a single case, which is of the competence of the EPPO and has just 30 pages. He was talking about the Commission’s assessment, which is at euinside’s disposal, where there are expenses provided for translation, based on the complexity of the case. The EC has estimated that there will be a need to translate around 5% of all cases. 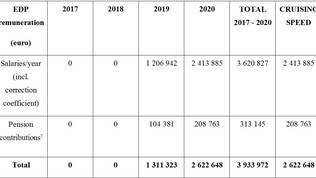 Not so complicated cases are estimated to be around 30 pages, which would cost 61 200 euro (for 20 cases). The most complicated cases are expected to be 500 pages each and the annual price for them is expected to be about 255 000 euro (for 5 cases). The medium complexity cases are estimated at 200 pages each with an annual expense of 1 020 000 euro (for 50 cases). The Estonian justice minister also warned that all efforts should be made to avoid having the EPPO approved without unanimity and was adamantly opposed to its existence through the enhanced cooperation procedure (where a group of member states decide to do something independently of the others, like it is with the financial transaction tax or the legislation ruling over asset disputes of trans-border partnerships and marriages). The draft regulation calls for an unanimous support in the Council and the approval of the European Parliament. Against the background of disagreements on the issue of whether VAT frauds should be included in the competences of the EPPO, disagreements with the full text of the draft regulation pale in comparison. The subject of VAT fraud is extremely serious and spreads over several spheres, which further complicates lawmaking at the European level. 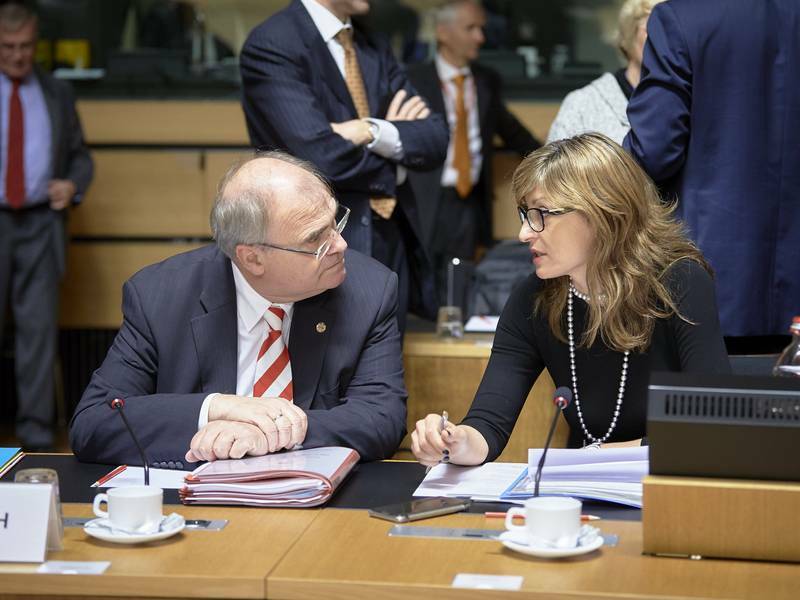 Parallel to the negotiations on the EPPO there are ongoing negotiations in the EU Justice and Home Affairs Council on a new draft directive of the European Commission regarding fighting crimes against the Union’s financial interests, known by the PIF abbreviation. On October 14, the discussion on the PIF was held before the one on the EPPO. One of the most controversial moments in these negotiations as well is VAT. The EC demands that VAT fraud be included in the scope of PIF, and thus enter the competences of the EPPO. Disagreements among ministers, however, are abundant. 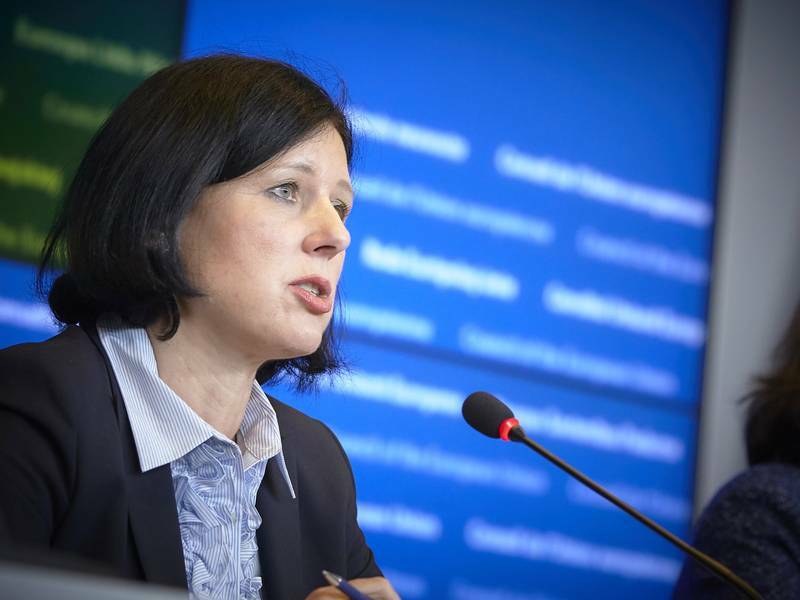 Věra Jourová explained that crimes under PIF are often linked to the so called “white collar crimes” – corruption, public procurement fraud, money laundering, VAT carousels, and common scams. She believes that if the EPPO receives the power to deal with VAT as well, it would enhance not only justice systems around Europe, but will also contribute to a great degree for a serious recovery of European funds. The Presidency put forward two main questions for discussion on October 14th – whether VAT fraud should to be included in the scope of the directive and whether they are to be included in the competences of the EPPO. The Slovak Presidency is of the opinion that those are purely political questions. 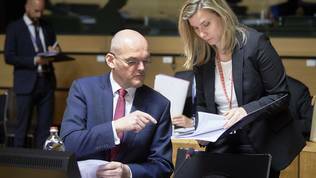 The discussion was pulled out of deep freeze after, due to anti-terrorist measures, the ministers of finance of the EU agreed (on October 11) to work at the European level for fighting VAT fraud and other financial crimes. The commissioner for justice is adamant that both questions must be answered “yes”, because in most cases VAT frauds are trans-border. Luxembourg had a positive reply to both questions. Slovenian Justice Minister Goran Klemenčič insisted that the fight against VAT frauds at the European level be limited only to trans-border cases and with a set high enough threshold at that. 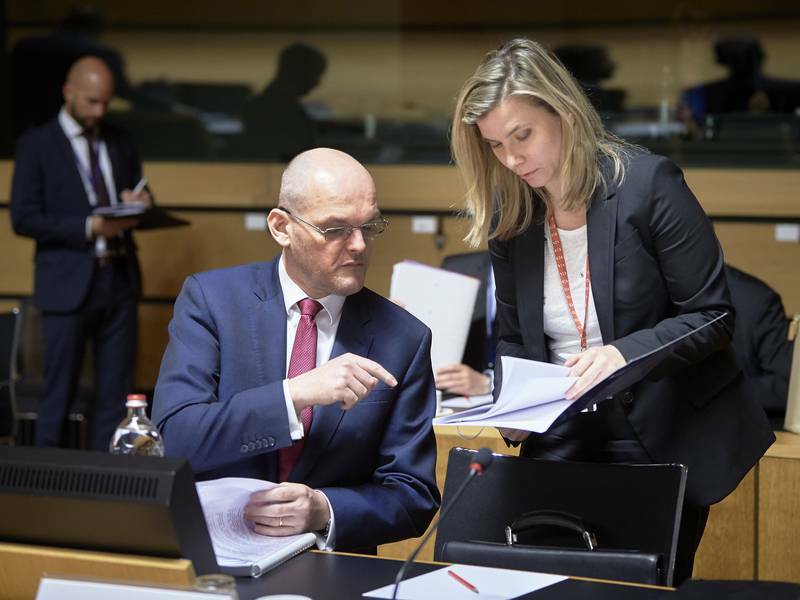 Most ministers gravitated towards the 10 million euro mark, while the EC estimate on costs and benefits of the EPPO is calculated based on a threshold of 2 million euro. In general, Slovenia supports the inclusion of VAT frauds in the scope of PIF, but is opposed to having the EPPO deal with this. “We don’t want to flood the EPPO with VAT investigations”, added Minister Klemenčič. The Netherlands is also opposed. Minister van der Steur said, however, that if The Netherlands is to agree, it would only happen under condition that it is only about very serious crimes, exceeding 10 million euro. He is definitely against the harmonisation of VAT frauds in the EPPO regulation. He does not see the logic behind having both the directive and the regulation deal with these frauds simultaneously. Poland was opposed to both proposals, because it believes that these problems should be addressed at the national level. Hungary is of the same opinion. A very small portion of the money passes through the European budget and indirectly at that, so national budgets are the ones most harmed, so, therefore, this is in the sphere of competences of national authorities, was the position of Hungary. France retorted that there already exists a judicial precedent, which proves that VAT frauds damage the financial interests of the EU. It talks about the ruling of the European Court on the Taricco case. Paris supports including VAT frauds in the PIF directive, but puts four conditions. The first one is for the scope of the directive not be expanded from VAT to other taxes. The second is that national competent tax authorities preserve their powers, mainly regarding the reimbursement of taxes. The third condition is finding a parallel approach between administrative and penal fines and the fourth one is agreeing on a common definition of a VAT fraud, so that European competence can be explained. France is of the opinion that including VAT in the scope of competences of the EPPO will breed legal uncertainty. The Czech Republic has so far expressed sharp resistance towards treating VAT frauds at the European level, but following the “Taricco” ruling Prague is willing to reconsider its position, provided a solid threshold of 10 million euros is placed. Ireland was firmly opposed. Minister Frances Fitzgerald said that tax issues should be discussed solely in tax legislation dossiers and are not to be included into non-tax legislative projects, the approval of which may not be unanimous. Another problem is that Ireland does not have a separate definition of VAT fraud in its national law. Dublin has principal issues against including VAT frauds in the EPPO Regulation. It was difficult for Romania to answer the questions, for both legislative dossiers are linked to each other. There could be no progress on one of them until there is some clarity on the other. In general, Bucharest has reserves against including VAT in the PIF directive and the EPPO regulation. Greece fully supports including these frauds in the EPPO competences list, as the “Taricco” case shows. The Bulgarian justice minister agrees to the widening of the scope of PIF directive to include VAT frauds, but is opposed to including them in the EPPO regulation. Cautious on the issue are also Sweden and Finland, although Helsinki exhibits sympathies to the idea of the EPPO taking over some VAT fraud cases, but prefers looking for alternatives. Belgium prefers VAT to be included in the competences of the EPPO, rather than the PIF directive. Latvia proposed a 3 to 6 million euro threshold for including VAT frauds in the PIF directive. Germany continues to be opposed and prefers more attention to be placed on public procurement orders, money laundering, and corruption. VAT should not be treated separately, said Minister Maas, but agreed on VAT being addressed by just the EPPO regulation, with Berlin prepared to lift all its reserves on this, as was also evident from the discussion on the consolidated text of the EPPO. Croatia also agrees that the EPPO deals with VAT frauds, only if they are included in the scope of PIF, however. Cyprus is opposed to having the scope of the directive cover VAT as well. Austria has not yet reached an agreement at the national level. Estonia is opposed to having the EPPO deal with VAT, but agrees with including it in the PIF directive. At the end of the discussion Věra Jourová stated that it will be extremely difficult for her as a politician to explain why the EPPO is not going to deal with the investigation of large tax frauds. The legal service explained that the design of both the PIF directive and the EPPO regulation is such that they have to work together. The goal of the directive is to harmonise a considerable part of the penal code. Here, we are not talking about the harmonisation of VAT or tax laws. Logic demands that both be combined, was the opinion of the legal service, which stated that it fully understands why some people might be opposed. Up until now the investigations of financial crimes against the interests of the EU were the job of OLAF.